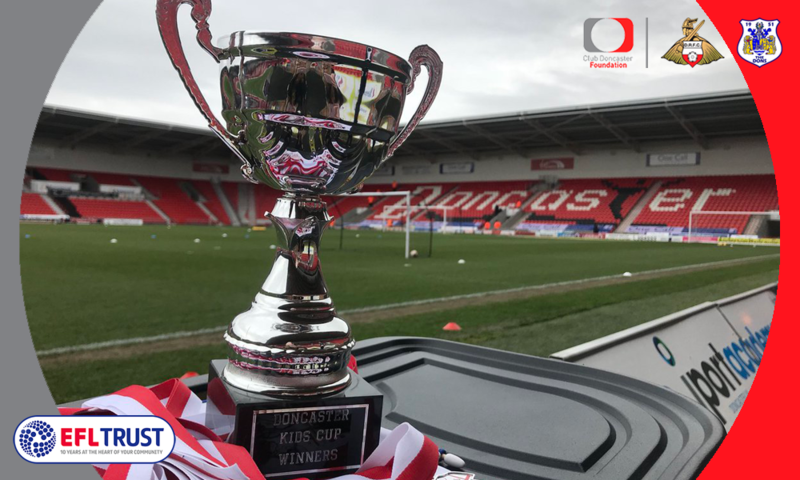 Reigning champions Sunnyfields will look to retain their Doncaster Kids Cup and progress through to the EFL area finals after being drawn in group G of the EFL Kids Cup. The Scawthorpe-based primary school won the competition in 2018 and have been drawn with Conisbrough Ivanhoe, Adwick, Kirk Sandall Juniors and Dunsville in group G.
The draw, which was conducted by Doncaster Rovers players Andy Butler and Alfie May, saw a record number of teams included. 2018 runners-up Owtson are in group F, whilst 2017 winners Warmsworth Red have been drawn in group C.
A total of 40 teams are set to take part in the competition at the Keepmoat Stadium on Friday January 25, including a host of new schools. East Cowick, Selby Abbey, Crookesbroom, and Mexborough Highwoods have all joined the competition, as they look to claim glory at the first time of asking. Two teams will advance from each group and take part in the knockout stages. Following the last-16, quarter final and semi final rounds, the two winners of the semi finals will be invited back to play on the Keepmoat Stadium pitch before the Sky Bet League One clash between Doncaster Rovers and Peterborough United on February 9.